When you´re a travel blogger there is always kind of pressure to find the most amazing places, restaurants, and cities around the world. As I went to New York it was pretty clear that there isn´t any place in SOHO, bar or rooftop in Manhatten that hasn´t been already mentioned as the top secret of the town. After I did my first tour around town, I realized, that it isn´t a certain spot, a building, bar or restaurant I was looking for to show you. Furthermore, it was the walk around New York I did that day. That’s the reason why I won´t tell you something about my fav place. Today I would love to take you with my on my favorite tour around town. 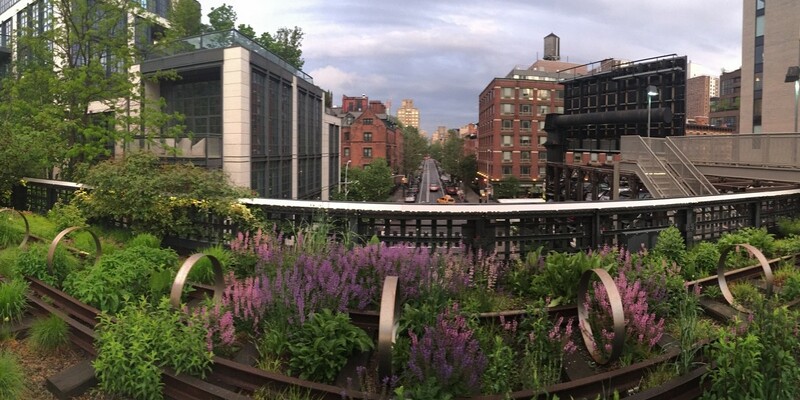 When there is a place I love the most, it´s the High Line Park, far away from the traffic of the streets. If you arrive at the Penn Station, I highly recommend you to make your way down the 33rd street across Madison Square Garden. Here you will find the James A. Farley post office. Maybe one of the most impressive post offices I have ever seen. If the sun is shining you can even take a rest on the stairs in front. After that, you will walk down the 33rd street until you reach 10th avenue at wich you go up tot he 34th street that will bring you down to the Hudson river where the High Line Park will start. The moment I walk up the stairs, the rain stops and the sun is breaking through the clouds. The High Line Park is round about 2.3 km long and guides you along the Hudson river. As an old metro route, it´s located high above the streets of New York. After it was shut down the city decided to transform it into a park in 2009. Though the rails are still there, instead of metro wagons plants are now covering it all the way, like a green lung. After a hard day at work or after a long day of discovering New York as a tourist, this is the best place to charge your batteries again or to take your time out. I enjoyed to sit down on a bank, surrounded by plants while eating my sandwich. If you have enough time take the chance to rest here for a while and to discover all the details like blossoms or animals. After you walked down the 2.3 km long metro route up tot he Meatpacking District, there will be enough time for a cocktail at Santina or great food at restaurants like Bubby´s, before you make your way back to the hotel.